There is a wide variety of hotels accommodation in Brisbane available on Aussie Hotels that has been specifically chosen because it suits the needs of business, tourist and leisure guests. The website contains a large number of Brisbane CBD hotels, budget Spring Hill motels, waterfront hotel suites and luxury accommodation overlooking the Brisbane River. So if you are either a discerning corporate executive, holiday traveller or family Aussie Hotels has something which will suit your budget whilst providing discount rates for longer stays in Brisbane. 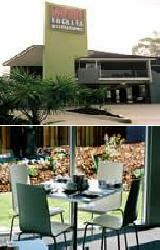 The Rocklea Motel / Hotel is one of the best Brisbane hotels in the heart of the Rocklea business district of Brisbane. This absolutely delightful hotel / motel is ideally located close to the Rocklea Market, Archerfield Airport and Speedway, Willowbank and Queensland Raceways, Southbank, the Gabba and the ANZ Stadium. Delicious restaurants are only a short walk away while the Brisbane CBD is a short 10 minute drive. The Windsor International Motel is unique amoung Brisbane hotels because it combines friendly hospitality, Australian history and modern Queensland architecture to provide guests with a unique accommodation experience. The famous Va Bene Italian Ristorante is situated within the Windsor International. The chef, Michele Loffredo with his authentic style, fine artistry and talents has touched the hearts and palates of many. Situated just north of Brisbane's central business district, with easy access to the city by bus, train or taxi, the Motel is conveniently located near the Royal Brisbane Hospital, Brisbane Exhibition Ground and the sporting venues of Ballymore Football Field and Downey Park. The Palms International Hotel / Motel offers guests the most luxurious rooms of all of the Brisbane hotels in Boondall. The Palms Motel Hotel Brisbane is conveniently located close to the Brisbane airport, Brisbane Boondall Entertainment Centre, Brisbane Northern Industrial Zones, Eagle Farm, Virginia Strathane, Virginia Golf Club and is only 20 mins from the Brisbane CBD. Providing quality hotel style rooms in the heart of Brisbane is what the Riverside Hotel Southbank is known for. It is one of the few Brisbane hotels situated an easy distance from the Brisbane Convention Centre, Treasury Casino, Queen St Mall, Queensland Performing Arts Centre, State Library & Cultural Centre, Southbank Parklands, Roma Street Parkland as well as a plethora of Brisbane's excellent restaurants, cafes, theatres and nightlife. With quality hotel rooms at discount rates the Riverside Hotel Southbank is a the ideal place to stay close to the Brisbane city centre. Annerley Motor Inn is located only 6 kilometres from Brisbane the city centre. Unlike most Brisbane hotels the Annerley Motel boasts a wide selection of hotel and unit room types at affordable prices, which means that there is something to suit just about everyone. When you stay at the Annerley Motel Brisbane you can easily explore the Brisbane CBD and all its city major tourist attractions. You can also relax by the swimming pool after a day of work or sight seeing at this quality Annerley accommodation. From this ideal location in the centre of the city, the Metro Hotel Tower Mill Brisbane places all the sights and experiences of Brisbane at your fingertips. Each hotel room has its own private balcony, and a variety of in-room features such as complimentary movies, foxtel and air conditioning. This discount property is one of the most popular Brisbane hotels in the heart of the city centre. With the hotel rooms positioned over eight floors, the Metro Tower Mill Hotel also offers ground floor conference and seminar facilities and a fully licensed ground floor restaurant and bar open 7 days for breakfast and Monday to Saturday for lunch and dinner. The Metropolitan Motor Inn offers relaxed executive hotel rooms in the heart of Brisbane. A warm welcome and a spacious, quiet hotel room makes The Metropolitan Motor Inn a refreshingly different motel, ideally located in Brisbane's Spring Hill business district and only two blocks from Brisbane's CBD. Like most Brisbane hotels the Metropolitan Motel Brisbane is a non smoking property. It offers guests well-appointed rooms that are simple, clean and modern. The Metropolitan Motor Inn contains all the conveniences expected of an executive hotel including FREE car parking, 24 Hour Reception, a restaurant, Conference rooms, Business Centre, room service, wireless Broadband internet, FREE underground car parking, Bar, FREE Foxtel, guest laundry, dry cleaning service and Wifi internet access. The Metropolitan Motor Inn is located just a short stroll to the CBD, Queen Street Mall and Myer Centre shopping, as well as Central Station and Roma Street Transit Centre. The Metropolitan Motor Inn is superbly located within close proximity to the Brisbane City Centre, Central Train Station, Roma Street Parklands, Suncorp Stadium, Ballymore, RNA Showgrounds, Hospitals, Churches, Aquatic Centre, Brisbane Cultural Centre, Botanic Gardens, SouthBank Parklands & Brisbane River - only an eight minute walk from the city centre and 25 minutes drive from the Brisbane Airport. Minto Guest House is a delight to the senses where guests can live in the colonial charm, feel the breezes on the veranda or chill out by the fire in the common room. This budget South Brisbane hotel exudes a special ambiance and is committed to providing clean, comfortable hotel and hostel rooms with exceptional guest house quality. Other features at Minto include a fully equipped huge Chef's kitchen & FREE fast wireless Internet. A stay at Minto will ensure a quiet, pleasant, harmonious way to have your weekend away in Brisbane. You can also check out even more budget Brisbane hotels. The Benson Court Motel provides business and leisure travellers to Brisbane with affordable studio hotel accommodation, centrally located in Toowong, which is just a short 3 minute walk to shops, restaurants & cafes. The Benson Court Motel is a 5 minute drive from the University of Queensland St Lucia Campus and Wesley Hospital, as well as being only an 8 minute drive away. from Suncorp Stadium. The Benson Court Motel offers affordable accommodation in spacious self-contained studio style units, which are serviced daily, air conditioned and feature ceiling fans, heating and comfortable bedding. Guests can enjoy an outdoor meal in the BBQ facilities and entertaining area surrounded by lovely gardens. Further guest facilities and services include FREE car parking, luggage storage, a guest laundry, breakfast room service, WiFi throughout the hotel, daily housekeeping, car hire, safety deposit boxes, wheelchair accessibility and cot hire. The City Edge Brisbane Hotel is the ideal home away from home providing friendly service with unbeatable rates and value for money that other Brisbane hotels can't match. The City Edge Brisbane Hotel specializes in hotel rooms that have been uniquely designed to suit the budget conscious traveller. The location in the city centre is ideal for the business and holiday traveller alike. Situated only a 3 minute walk to Treasury Casino, 150 metres to the Transit Centre, Queen Street Mall and is also close to the Southbank Parklands, Roma Street Parklands, Lang Park (Suncorp Stadium) and King George Square. This means that when you stay at the City Edge Brisbane Hotel you will be in the heart of everything that Brisbane has to offer. Centrally located in the heart of Brisbane, the City Edge Brisbane Hotel represents unbeatable value for money in the CBD. The Brisbane Manor Hotel is a great value home away from home which prides itself on being one of the best budget hotels in Fortitude Valley, Brisbane. The hotel is a fantastic heritage building with a leafy green veranda, waterfalls and sundeck bar. Built around the end of the 1800's this heritage Manor building is one of a kind and allows you to experience what Queensland yester year felt like. Located in the heart of Brisbane, in the Valley, the Brisbane Manor Hotel is walking distance to China Town and some of the best pubs, clubs and restaurants Brisbane has to offer. The valley nightlife is also on your doorstep. Offering clean hotel rooms, ranging from Single Standard and Double hotel rooms to the Superior Queen and Deluxe King rooms. Even the single rooms have their own balcony overlooking an internal courtyard. The Brisbane Manor Hotel prides itself on being one of the best budget Brisbane hotels available. The recently refurbished Rydges South Bank Hotel offers luxury hotel accomodation in Brisbane's most enviable location, the arts and entertainment precinct in South Bank. The Rydges Hotel Southbank is one of the only Brisbane hotels that adjoins with the Brisbane Convention & Exhibition Centre via a walkway and is also a short walk to the Queensland Performing Arts Centre (QPAC), Queensland Museum, State Library of Queensland and the new magnificent Gallery of Modern Art (GOMA). Also the Brisbane CBD, Treasury Casino and the Queen Street Mall are an easy 10-minute stroll away. The Rydges Southbank Brisbane is the perfect place to take advantage of Brisbane's great weather and outdoor lifestyle. Wander through the weekend arts and craft markets, take a dip in South Bank's man-made beach, walk or jog along the extensive jogging tracks or enjoy a barbecue or picnic in the parklands. This Brisbane hotel offers newly refurbished guest rooms with high-speed, secure broadband internet, air conditioning, 24-hour room service and hotel facilities such as a complimentary gymnasium, sauna and spa to all hotel guests. Located in the very heart of Brisbane CBD the luxury hotel rooms at the Royal on the Park Hotel is ideal for corporate business and holiday travellers alike. Offering a variety of hotel rooms and suites, this Brisbane hotel overlooks the Brisbane River and Botanic Gardens and is within easy walking distance to city centre, South Bank, Brisbane Convention and Exhibition Centre, Treasury Casino and the Riverside Centre. Brisbane hotels in the city centre don't get much better than the Royal on the Park with it's great discount rates. The Traders Hotel Hotel Brisbane is a perfect destination to take advantage of all that Brisbane has to offer. Unlike some Brisbane hotels is is conveniently located adjacent to the Brisbane Transit Centre, Roma Street Parkland and only a short walk to the central business district, theatres and major shopping mall. You are assured of a warm welcome at the Traders Hotel Brisbane and guests can spend a morning in the Botanic Gardens and then indulge in some shopping before a visit to the Art Gallery, theatres or casino. With a range of hotel rooms from Superior Standard to King Studio Suites complete with magnificane views, either of the Roma Street Parkland or the Brisbane city skyline. The Holiday Inn Brisbane provides business class amenities as well as an on-site gymnasium, massage therapists, Restaurant and Bar.